Stephen King's 'IT' house was built here in my hometown! Just in case you missed them, here are some of our best Halloween freebies and a whole bunch more freebies! 🎃 McDonald's has a new (and, well, better) Halloween-themed game called Trick. Treat. Win! ith this game, you can win two different ways: either instantly, by peeling off game pieces on some McDonald's packaging, or in the chain's app. 🎃 Pick up the Wendy's® Boo! Book for $1.00 and get five free Jr. Frosty coupons. 🎃 Five locations around the country offered a free Burger King Whopper to customers. To get the burger, you had to be among the first 500 through the doors between 7 pm and close, and had to be dressed as a clown. This offer was valid at restaurants in the Miami, Boston, Los Angeles, Austin, and Salt Lake City areas. 🎃 Chick-fil-A - Calling all kids in costume! On October 31st from 11am-9pm at Chick-fil-A, all kids ages 12 and under who arrive in costume will be treated to a FREE Chick-fil-A Kid's Meal (4-count, classic). One per child, Dine in only. 🎃 Three Tricks to Turn Chick-fil-A into Halloween Treats - while your trick-or-treaters are getting ready for the night, here are three simple, festive Halloween snack ideas. 🎃 Do it yourself: 3 Halloween costumes for Chick-fil-A fans - Simple and clever costumes for the whole family – pets included. 🎃 Build-a-Bear: Come into the store through October 31 and get a Halloween snack treat. No purchase necessary for a treat. While supplies last. 🎃 Score a FREE doughnut on October 31 when you wear your Halloween costume to a Krispy Kreme store! Valid only on October 31. No purchase necessary. No masks should be worn. One per person. Only valid at Krispy Kreme store locations (not grocery stores or gas stations that sell the doughnuts). 🎃 Get in the sweet, sweet, Halloween spirit with their Spooky Dozen. 🎃 Chuck E. Cheese - DIY Halloween Costume Ideas + Chucktober means your kids get to play all the games they want, as many times as they want, no exceptions! 🎃 BurgerFi - On October 31, customers in costume will receive a FREE small custard at participating BurgerFi restaurants nationwide (limit one per guest, no substitutions). 🎃 Text a code to 727272 to receive a code for a free 1-day Redbox DVD rental. Also good for $1.50 off a Blu-ray or video game rental. 🎃 Nestle Toll House Cafe by Chip Adults and kids alike could wear a costume to receive a free chocolate chip cookie at a participating location. 🎃 Easy Halloween Tricks and Treats for Busy Moms - Halloween should be a fun time for the entire family, but if you are a busy mom, it can be difficult to get into the 'spirit' of things because there always seems to be so much to do. This guide is designed with YOU in mind, to help serve as a checklist of the many options you have for celebrating Halloween. 🎃 Applebee's - Kids Eat Free special on Halloween. Families who dine-in at their local Applebee's restaurant Oct. 31 will receive two free kids' meals with the purchase of each adult entrée. Offer is good for children 12 and younger. They can choose entrees off of the Applebee's Kids' Menu, including a side dish, and juice, milk or chocolate milk. 🎃 Applebee's - Just in time for Halloween, the Dollar Zombie is described by Applebee's as a mixture of rum, pineapple, passion fruit, cherry, lime and garnished with a gummy brain. 🎃 Dunkin Donuts is offering free mobile wallpapers. 🎃 Dunkin Donuts: No frights, just delights: Scare up sweet spirit of the season with two OREO® treats and the return of Dunkin's Spider Donut. 🎃 Dunkin Donuts invites guests to support Community Cups, an in-store national fundraising program to benefit the Joy in Childhood Foundation, the charitable foundation supported by Dunkin' and Baskin-Robbins. Participants will be given a paper icon showing they gave joy, to sign and display at the restaurant or take home. As an additional thank you for guests' support, the paper icon also includes a special coupon to be redeemed for $1 off the purchase of a dozen donuts. Expires December 31, 2018. 🎃 Baskin-Robbins - On October 31st guests can celebrate Halloween in the sweetest way possible with any regular or kids-sized scoop of ice cream for $1.50 at participating locations nationwide – bone appetite! 🎃 Baskin-Robbins - Enjoy a spooktacular product lineup including the Fang-Tastic Monster Cake, Trick OREO® Treat Flavor of the Month and wickedly good deals such as a small Cappuccino Blast® for $2.99. 🎃 IHOP® - Kids (12 and under) get a FREE Scary Face Pancake between 7am-10pm on October 31 at participating locations. Create the spookiest, kookiest pancake you can imagine using strawberries, whipped topping, Mini OREO® cookies, candy corn. 🎃 Papa Murphy's - Jack-O-Lantern pizzas, an annual tradition, are available now through Halloween at most Papa Murphy's locations. Get a large for about $9.00 or a Family Size for about $12.00 (prices vary by location). 🎃 Salty's (Seattle/Portland) – Spooky Brunch - Kids 13 and under who wear their Halloween costume and are accompanied by an adult ordering brunch get to eat free on Saturday, October 27th and Sunday, Oct. 28th, 2018. 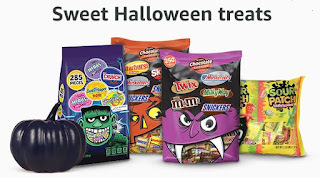 🎃 Order your last minute Halloween candy from Amazon! NOTE: Be sure to call your local restaurant ahead of time to see if they are participating. 🎃 FREEBIE - Halloween Printables | Activity Village - Enjoy this huge collection of Halloween printables - for use in the home or classroom and for all sorts of Halloween projects! 🎃 FREEBIE - Halloween Printables - Mr Printables - Six printable Halloween mask designs for kids. Take a look at our fun halloween printables for halloween activities, crafts, party and dress up! 🎃 FREEBIE - Monster Mash Halloween Printable - Add some fun Halloween decor to your home with this Monster Mash Halloween printable! Perfect to use in any Halloween display or use them to create your Halloween party invitations. It will be a graveyard smash! 🎃 FREEBIE - Cute Free Printable Halloween Coloring Pages - these free printable Halloween coloring pages are a lot of fun to color! 🎃 FREEBIE - Printable Halloween Memory Game - We have included almost everything you would expect to find on Halloween including bubbling cauldrons, a haunted house, and some of your favorite Halloween monsters. 🎃 FREEBIE - 25+ Free Halloween Printables - Halloween printables are the perfect way to decorate your home for Halloween in a hurry. Simply print, put in a frame, and display! 🎃 FREEBIE - Halloween Papercrafts - Free Papercrafts, Paper Models, Paper Toys and Origami Download. 🎃 FREEBIE - Printable Halloween Scavenger Hunt - Use while you are out trick-or-treating and need to keep little ones moving between houses, or on a family walk around the neighborhood, while the Halloween decorations are still up. 🎃 FREEBIE - Perfect Pumpkin Carving Patterns for Every Personality - From those designed to make you laugh to those that will make you scream and everything in between, here are seven of the best sites to find the most fabulous printable pumpkin carving templates out there. 🎃 FREEBIE - Digital Halloween Music and Sound Effects - Listen for free with Amazon Music Unlimited. Listen to any song, anywhere. 🎃 FREEBIE - Halloween Wine Bottle Stickers - Embalming Juice, Rat Poison, Zombie Virus, and Spider Venom. 🎃 FREEBIE - Halloween Music/Radio - Get your Halloween spirit on and listen to Halloween Music while you decorate or as a backdrop to your Halloween party this year! Happy Halloween!! 🎃 FREEBIE - Printable Celebrity Masks - Why dress as a ghost or a vampire this Halloween when you can disguise yourself as someone genuinely scary -- like Iranian President Mahmoud Ahmadinejad or bald-headed problem parent Britney Spears. 🎃 FREEBIE - 10 FREE Halloween Costume Ideas - Have you seen the prices on Halloween Costumes? There's no need to go broke, or spend any money at all! Use common household items to make these FREE costumes for Halloween this year! 🎃 FREEBIE - Over 200 Free Halloween Crafts Projects - craft projects, including Pumpkin Carving, decorations, costume ideas, children's crafts, crochet project and patterns, treat recipes, and more. 🎃 FREEBIE - Pumpkin Carving Patterns - offering over 100 free patterns for you to download. 🎃 FREEBIE - Halloween Party Recipes and Ideas from Kraft! - Everything you need for Halloween is here! Find Halloween recipes including essentials such as Halloween Appetizers, Halloween Cakes and Cupcakes. Discover great Halloween Party Planning tips, Decorations, fun Party Games and Ready-To-Go Pumpkin Carving Stencils. 🎃 FREEBIE - Halloween Jokes and One-liners - Free, clean, yet funny Halloween jokes and pictures. Eat, drink and be scary. 🎃 FREEBIE - Halloween Pumpkin Carving Stencils - Orange and Black Pumpkins is a pumpkin pattern database featuring over 175 original stencil designs by Randy Sabourin. 🎃 FREEBIE - SuperTeacherWorksheets.com Halloween Worksheets - Add some Halloween fun to your class with these printable teaching resources. On this page you'll find educational games, like The Pumpkin Sum Game. We also have Halloween reading comprehension passages and poems. And don't forget to browse through the craft activities, where you can download a Halloween diorama kit and a paper Frankenstein monster with arms and legs that move. 🎃 FREEBIE - 72 Printable Halloween Masks - Not only would these printable Halloween masks be a great start to a homemade costume but they would also be great as favors for a Halloween party. They make a great free Halloween costume too if you're pinched for time and money this year. 🎃 FREEBIE - 14 Free Halloween Printables for Kids - Some of these free Halloween printables for kids will help them learn, others will encourage them to use their imaginations, while other Halloween printables are really just so they can have fun. 🎃 FREEBIE - 43 Practically Free Halloween Costumes to DIY - If you don't want to go broke splurging on an outfit this spooky holiday, check out some of the best ideas they found that will cost little to nothing to throw together! 🎃 FREEBIE - Halloween Mystery Box Game - The Halloween mystery box game is a popular Halloween party game that will have players reaching into dark boxes to feel items like eyeballs, bones, guts, and fingers. The trick to this game is that inside the boxes are actually everyday items that the players will need to try to guess the identity of. 🎃 FREEBIE - Printable Halloween Cards - a great way that you can wish friends and family a Happy Halloween. Some are sweet and some are spooky but all of these Halloween cards can be used to send best wishes to the recipient. 🎃 FREEBIE - Fear the Walking Dead: Dead Run - This exhilarating tactical runner (official mobile game of the hit AMC series) puts you inside the apocalyptic fall of Los Angeles. Relentlessly pursued by the undead, you flee across familiar LA landscapes as the city is overrun; an abandoned church, a high school, the local sports arena. Shoot too much and you'll slow down. Don't shoot enough and you'll be overtaken. 🎃 FREEBIE - Hallmark - has a printable bat wings template for Halloween. Click for more Halloween ideas from Hallmark. 🎃 FREEBIE - Online Labels has an assortment of printable Halloween labels. 🎃 FREEBIE - 20+ Printable Halloween Pages to Color While Eating Candy Corn - You already know adult coloring is one of the latest crazes — it's the perfect way to de-stress and unwind, after all! So now we're bringing you free printable pages with a Halloween twist. Start thinking skeletons, haunted houses, witches, and candy (of course) because Oct. 31 is creeping closer! 🎃 FREEBIE - 'Clutching Hand' Horror Comic Book - The Clutching Hand was a classic Horror Comic Book from the 1950s. Get you free digital copy today. 🎃 FREEBIE - Printable Woodland Stencil Booklet - gives step-by-step instructions, stencils and guides to creating leaves, squirrels, owls, moons, raccoons, mushrooms, deer, mice, acorns and pawprints on your Halloween pumpkin. 🎃 FREEBIE - 23 Sets of Free Halloween Bingo Cards - Halloween bingo cards are a great game that children can play at school, Halloween parties, or just at home with their siblings or friends. Besides being fun, Halloween bingo is a great game for teaching listening skills. It's even easy enough that even young children can play. 🎃 FREEBIE - 14 Easy Printable Pumpkin Carving Patterns - Easy, free pumpkin carving patterns to help you create amazing pumpkin carving designs. Fun ghosts and words like Boo will help you carve your way to perfection this Halloween. Looking for more classic and simple? Try their easy, breezy leave pumpkin templates. The printable pumpkin carving patterns are easy to download and don't cost a thing! Or create luminaries to light up your walkway or porch! 🎃 FREEBIE - Pumpkin Carving Patterns from WWF Free Stencil Downloads - Show off your passion for animals on your pumpkin! To download these pumpkin carving stencils, simply sign up to receive free WWF email, including e-newsletters and alerts for the latest conservation news. 🎃 FREEBIE - Scary Little Stories: Light-Hearted Spooky Short Stories! - Enjoy some fun spooky short stories with this collection of 13 light-hearted scary tales. With just enough fright to delight, a few goosebumps here and there to satisfy even the grumpiest ghoul. It's a world of dark jumps and jitters, a book of goblins, ghosts and horrible things at most. All to die for! Or not! 🎃 FREEBIE - Halloween Spooktacular at American Girl - Girls who wear a costume into the store on October 28 and October 31 will receive a sweet treat (while supplies last). Plus, take part in a fun craft and pose for a photo op. Check your local store for times. Check out a participating comic book store during the Halloween ComicFest event (Oct. 27, 2018), to get a free comic. Use the store locator to find participating comic book stores in your area. 🎃 FREEBIE - Enter The Greatest Halloween Costume Contest Ever! - Costume contest photo submissions can be submitted starting October 1, 2018 and close Thursday, November 8, 2018 at 11:59PM. 🎃 FREEBIE - Over 200 Free Halloween Costume Ideas for Kids - Home-made costumes are the best! Create some family memories and perhaps win a prize or two with these creative free Halloween Costume ideas and patterns. Whether a simple witch or complicated monster costume, you can save some cash and have fun making your own Kids Halloween Costumes. Over 200 costume ideas here, including Harry Potter, Batman, Angry Birds, Minecraft, Dracula, and more. 🎃 FREEBIE - Silly Spider Puppet Craft from Lakeshore Learning - Kids (3 and up) can stop by on Saturday, October 20 from 11 am-3 pm to make a Silly Spider Puppet craft. October 27th to make a I Want to Be... Career Mask. November 3rd to make a Falling Leaves 3-D Tree. And more! 🎃 FREEBIE - Michaels – Halloween Activities - Let your kids explore their creativity while you shop! Kids (3 and up) can enjoy a quick project and take home a finished masterpiece. On October 20 - MAKEbreak Halloween T-Shirts, or Creepy-Crawly Cobwebs. October 21st - The Ultimate Slime Party. October 22nd - MAKE Halloween Cupcakes. October 27th - MAKEbreak Monster Slime and Jar or Monster Bash. 🎃 FREEBIE - Spooktacular Petsmart Halloween Celebration on Saturday, October 20th and 21st from 12-3pm! Dress your pet in their Halloween best for a dog costume parade and contest! Pet parents will also take home a FREE pet collar safety light and boo bag treats. Plus FREE stickers for the kids. 🎃 FREEBIE - Halloween Printables from Avery - Decorate Your Day of the Dead Celebration, EEK! There's a Spider in My Halloween Treat, How to Make Boxed Mints Favors for Your Zombie Party, Party Tips for a Hello Kitty Halloween, Place a Spell with Personalized Potion Labels, Spirited Party Ideas to Keep You Awake at Night, Warning - Zombie Party Ahead!, You've Been Booed! 🎃 FREEBIE - Pumpkin Pile - The Internet's Best Place for Free Pumpkin Patterns. Halloween Pumpkin Carving Patterns, Stencils and Templates! Their pumpkin carving patterns can make anyone an amazing pumpkin carving artist. 🎃 FREEBIE - Halloween: Scary Halloween Stories for Kids - Are you brave enough to read these spooky and scary Halloween stories? If you enjoy the Goosebump series, you will love these hair-raising and frightful tales. These Halloween short stories are quick and easy to read. These are the perfect ghost stories to read around a campfire with friends and family. 🎃 FREEBIE - More than a dozen Halloween-themed reads - available for your Kindle (or free reading app) at no cost on Amazon's website. 🎃 FREEBIE - Disney store Haunted Halloween Party - Every Saturday in October at 1pm, 2pm and 3pm, join us in store for a frightfully fun Haunted Halloween Party and receive a free Mickey Mouse pumpkin light up wristband. RSVP required to participate. Contact your local store. Event is intended for Guests ages 3 - 12 and limited to 20 participants per event. Giveaways are limited and and will be given to Guests ages 3 - 12 that RSVP. 🎃 FREEBIE - Watch Free Horror Movies Online! - Watch streaming thrillers, zombie films, sci-fi movies, creature and monster movies. The dead walk the earth and feast upon the living. Ghosts haunt the night in search of revenge. Serial killers and slashers are on the loose. Vampires and creatures hunt human victims. Men transform into werewolves and attack their loved ones. Mysterious monsters dwell in caves, underwater, in the mountains and in the snow. Science-fiction adventure with nuclear holocausts, time travel and scientific experiments gone mad. You'll find it all here, watch Horror movies online, completely free! 🎃 FREEBIE - Free Halloween Printables: Spell Book - Create one of these Printable Spells and Enchantments Book for your Halloween Decor. 🎃 FREEBIE - Halloween Printable: Potions Book - Creatre a Halloween Potions Book to add to your display as part of your Halloween Apothecary. 🎃 FREEBIE - 40+ FREE Halloween Printables - Printables are the easiest and most inexpensive way to decorate. You just print off your favorite prints and stick them in a frame, and you have super cute decor!! It's even better when you can find some nice frames at Goodwill for super cheap, and easily spray painted to put them in. 🎃 FREEBIE - Halloween Crafts and Free Party Printables - Amy Locurto has created a lot of Halloween Crafts, Free Party Printables and Fun Food Halloween Recipes on her blog. 🎃 FREEBIE - Free Halloween Printables and Projects - Better Homes and Gardens has made Halloween prep easy with fast and easy printable downloads. Get your favorite pumpkin stencils, festive activity sheets, Halloween decorations and more — they're all free! 🎃 FREEBIE - Free Halloween Printables - Halloween flashcards, Halloween worksheets, Halloween lesson plan materials, coloring pages, printable Halloween games and more. 🎃 FREEBIE - 100 Free Halloween Printables - Halloween is scary enough without having to find spooky ideas on your own, so MomsByHeart.net did the legwork and found over 100 Free Halloween Printables. 🎃 FREEBIE - 19 Printable Halloween Decorations - Celebrate the day of ghosts and goblins with these spooktacular free printable Halloween stickers, treat bags, games, and more! 🎃 FREEBIE - 41 Printable (and Free!) Halloween Templates - From printable party invites to cute cupcake, gift bag and party favor embellishments plus pumpkin-carving templates and props for a photo booth, these will help you get your spook on this Halloween. 🎃 FREEBIE - 40+ Free Halloween Printables - HappinessIsHomeMade.net shares her favorite free Halloween printables available on the web. 🎃 FREEBIE - 20 Free Halloween Printables - Featuring several incredibly talented women who have designed free Halloween printables so we can make these beautiful crafts at home. 🎃 FREEBIE - Halloween Printable Activities - From DLTK's Crafts for Kids: Halloween bookmarks, calendars and coloring pages, jigsaw puzzles, doorknob hangers, festive domino toppers, and more. 🎃 FREEBIE - Halloween Printable Worksheets - great for teachers, homeschoolers and parents. 🎃 FREEBIE - Free Halloween Printables - Halloween Party Printables to help you decorate your Halloween party this year! Collections include: invitations, a welcome sign, 2" cupcake toppers, Happy Halloween banner, favor tags, tented cards and water bottle labels. 🎃 FREEBIE - Macbeth Halloween Decor - This Macbeth Halloween decor is sure to scare your little ghost and goblins. 🎃 FREEBIE - Halloween Printables - currently available are Halloween coloring pages, Halloween mazes, Halloween word search puzzles, dot to dot printables, cryptogram puzzles, some Halloween crafts for kids, and more. There is also a Halloween Did You Know... section with 5 interesting facts about Halloween. 🎃 FREEBIE - Target Trick-or-Treat Event - Saturday, October 27 10-1pm. Celebrate Halloween at your local Target. Kids are invited to come in costume and trick-or-treat their way through the store, plus watch an exclusive episode of PAW Patrol. There will be exciting giveaways* too, so don't miss out! 🎃 FREEBIE - Zombie Proofing and Defense - Preparing for the Zombie Apocalypse? Find the supplies you need to protect yourself from a zombie attack. I have compiled a selection of products to help address all your protection from zombie needs, including home repairs, defensive tools and zombie proofing. 🎃 FREEBIE - Prepare for your Zombie unLifestyle - Worried about how you will manage as the one of the undead? I have complied a list to help you out, with everything you will need to keep yourself in one piece. 🎃 FREEBIE - Disney Halloween - Time for some spooky fun! Check out all of the magical Disney-inspired kids Halloween costumes, games, crafts, decorations, and recipes — and have some ghoulish holiday fun. 🎃 FREEBIE - Lorax pumpkin carving template - Use a push pin, nail or plastic pumpkin carving tool to poke holes through the pattern and into the pumpkin to outline the black areas of your design. 🎃 FREEBIE - Free Halloween worksheets and Halloween math worksheets. Children learn best when they are engaged and having fun, so these worksheets are designed to capitalize on their enthusiasm for the upcoming Halloween holiday with some Halloween-related activities filled with friendly ghosts, adorable witches, and creative jack-o-lanterns that practice important basic skills like counting, graphing, pattern creation, word identification, handwriting, sight words, and more. 🎃 FREEBIE - Halloween fun from Oriental Trading. • Halloween Recipes - Cast a Spell with Devilish Desserts and Sweet Treats! • Pumpkin Decorating Stencils - Dress Up Your Pumpkin! Watch out for Zombie Gnomes! 🎃 FREEBIE - Pumpkin Carving Stencils from Educents - Carve out some craft time with the kids, literally! This festive set of easy-to-use downloadable pumpkin stencils are sure to bring fall fun and spooky delight for the entire family. Designs include a goofy grin and a midnight moon. Download includes 6 pages of stencils. 🎃 FREEBIE - Click on one of the Halloween stencils, print it, place it on your pumpkin and you are ready for carving! 🎃 FREEBIE - Grab a M+M stencil for your pumpkin. Plus some cute iron-ons for an M+M candy costume. 🎃 FREEBIE - Halloween Craft Ideas - Celebrate Halloween with a kid‑friendly monster bash! See fun craft ideas and spooky party décor. 🎃 FREEBIE - DIY Halloween Cups - Make your own Jack-o-lantern cups for Halloween which are fun to customize. 🎃 FREEBIE - 1,643 Free Pumpkin Carving Patterns and Templates - These free pumpkin carving stencils, patterns, and templates will allow you to create a unique jack o' lantern to put your neighbors and trick-or-treaters in awe. They're also extremely easy to use, so you can create something awesome even if you're a beginner. 🎃 FREEBIE - Celebrate Halloween with Martha Stewart - Celebrate Halloween with crafts, pumpkin carvings, Halloween costumes and make-up, decorations and recipes. 🎃 FREEBIE - Are you having a Halloween party, or haunted house? Here's some great printable labels to add to your bottles of weird stuff - Petrified Butterflies, Snake Oil, Vampire Fangs, Fur of Werewolf, Earthworms, toadstool clippings, Swamp Fog, Graveyard Dust, Twisted Twigs, Vampire Blood, Moon Dust, Poison, Zombie Virus and more! 🎃 FREEBIE - Online Halloween Games - These are all online games, no downloading required. 🎃 FREEBIE - 3D Paper Purgatory Models - Make your own spooky 3D paper models for Halloween, or anytime! 🎃 FREEBIE - Printable Halloween/Playtime Masks - Want to be a crazy chicken for Halloween? Here's a printable mask! More printable masks: Bunny, Evil Ronald, Cow, Zebra, Witch, Vampire, Princess, Marvel, Zombie, and Alien Masks. 🎃 FREEBIE - Halloween Lunch Box Jokes - Make memories with your children - put Halloween jokes in their lunch box! 🎃 FREEBIE - Moving Sculpture Illusion - Here's an eerie optical illusion you are sure to enjoy! It's quick to print, and easy to build. And it's very convincing! 🎃 FREEBIE - Halloween Colouring Pages from Fisher-Price- some adorable Halloween pages to print. 🎃 FREEBIE - 48 FREE Pumpkin Carving Patterns and How-To Guide! This is not your ordinary assortment of free pumpkin patterns. You will find only the grossest, silliest and most disturbed pumpkin ideas in this packet. 🎃 FREEBIE - 35 Halloween Pumpkin Carving Stencils from Better Homes and Gardens. Use these stencil patterns to create cute (or creepy) Halloween pumpkins to surprise your guests. 🎃 FREEBIE - Create personalized Halloween ecards and videos. Insert your photos into one of their templates to create hilarious songs with animations. 🎃 FREEBIE - No Candy/Trick or Treat Printables - Do you not celebrate Halloween, or maybe you ran out of candy? 🎃 FREEBIE - Haunted Paper Toys - Here is a variety of rather unusual paper toys, all free for you to print out on heavy card stock and enjoy. ♦ The Halloween Costume Shop - If you are the kind of ghoul who likes to DIY, they has plenty of pieces to help you create the perfect Halloween costume. Tiaras and tutus abound along with wigs, hats, face paint, masks, fairy wings, and feather boas to help you sink your fangs into the Halloween spirit. You can also find Halloween-theme clothing, socks, and jewelry in black and orange along with capes, gloves, glasses, wands, temporary tattoos, and other spooky, kooky accessories. Hey this is the nice list of Halloween.